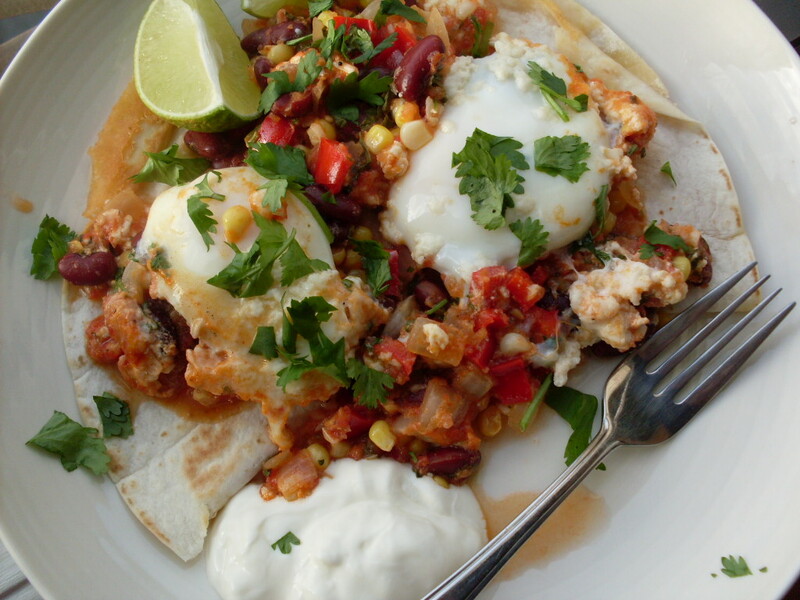 Meatless Monday: Huevos Rancheros in Purgatory. In the spirit of Meatless Monday, we had a fancy sort-of-breakfast for dinner. It’s the fresh and hearty love-child of huevos rancheros and eggs in purgatory, and it’s something you could serve for any meal, whenever. 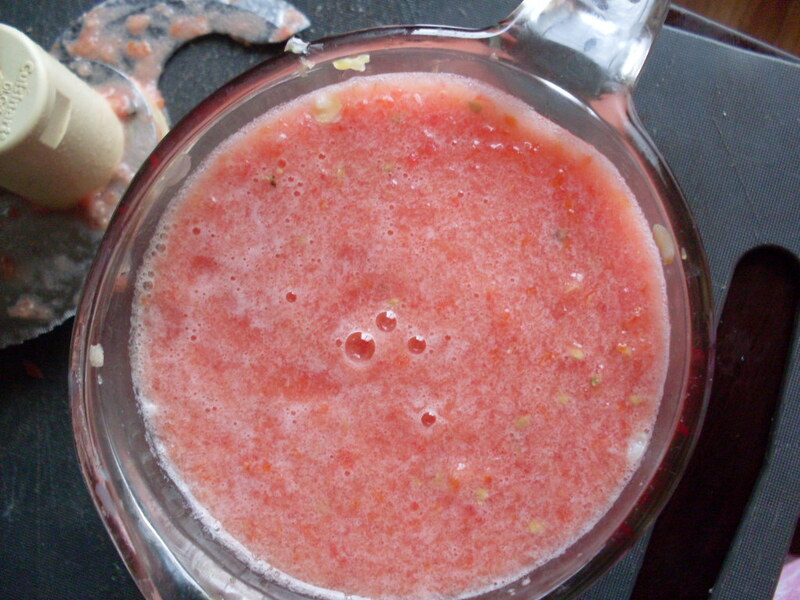 You can make the sauce ahead of time – if you call it a sauce. It’s more like a quick, loose chili, or a Mexican-inspired marinara with corn. Either way, it happened once by accident and turned out to be awesome, so I wanted to share it with you. One of this dish’s best features is that comes together in 30 minutes, which is all the time I have for anything on a Monday night. And the most important thing about it is that you serve it over a tortilla, which, if you’re feeling sassy, you fold over, fill with cheese, and stick in the oven so that it warms up and the cheese melts. Nick isn’t fully sold on Meatless Mondays, but is willing to go along with any of my enthusiasms if cheese is involved. Serve with a slice of lime, a bit of plain yogurt or sour cream, and a sprinkle of cilantro. Sauté onion in oil, in a large pan over medium-high heat, until translucent. 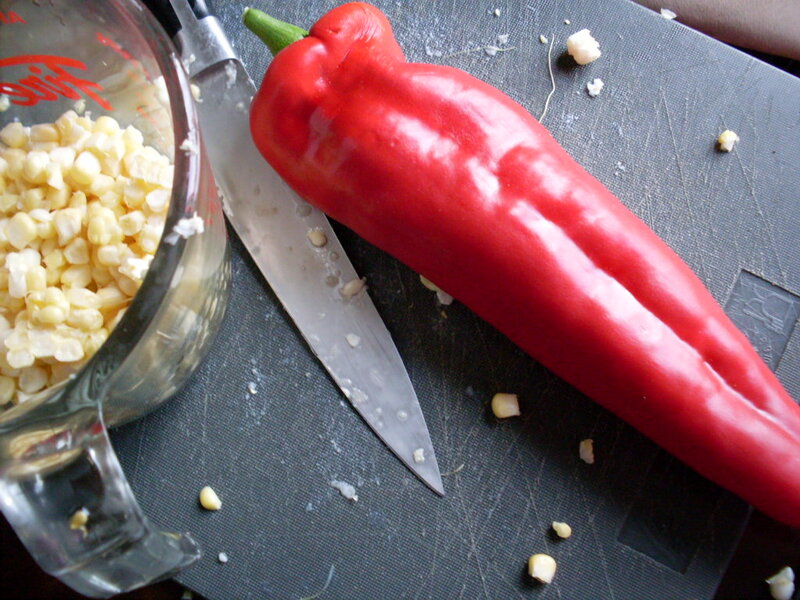 Add garlic, corn, red pepper, and jalapeño, and cook until glistening, about three minutes. Stir in tomato purée, beans, salt, chili powder, cumin, and oregano, and simmer for five minutes, until reduced and thickened slightly. Remove from heat, and crack eggs over top. 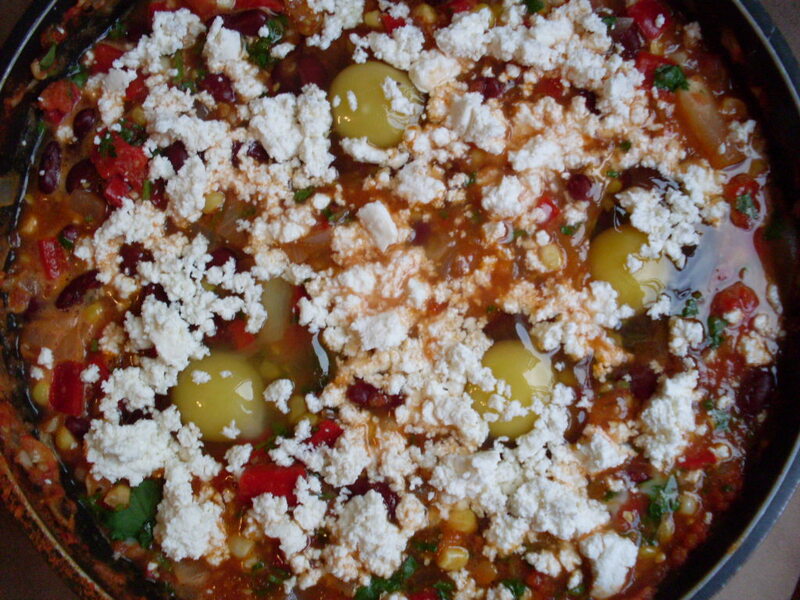 Sprinkle with queso fresco (or whathaveyou). If you’re in Vancouver, you can buy queso fresco and a variety of Mexican cheeses at Killarney Market over on 49th and Elliot. Throw the pan into the oven, middle rack, and bake uncovered for 12 to 15 minutes, until whites are cooked and yolks are done to your liking. Serve over tortillas, sprinkled with cilantro. If you opt to serve these over quesadillas, sprinkle 1/4 cup of grated cheese over half of each tortilla, fold over, place on a cookie sheet, and bake with your huevos for the last five or six minutes of their cooking time. Enjoy! These are cheap, fresh, easy, fast, and really, really tasty. The corn and peppers are sweet, and the tomatoes lend a tart whoosh to things, and the beans make you forget there isn’t meat, in case the cheese wasn’t enough for you. The eggs are good because eggs are always good. And the cilantro makes it taste like Mexican Night without all the trouble and effort you always seem to have to go to on Mexican Night. Try it, and let me know how you like it! Update: This recipe has since been posted over on the Meatless Monday website. Go check it out! < Previous Garden report: A shaky little tour. Next > Chocolate zucchini cake: It’s outrageous! Oh yes. Making this tonight. Since apparently I am boycotting the grocery store completely, I can totally make do with what I have at home (cheese, tortillas, eggs, beans) and a few random things that can be picked up at the farmers’ market. LOVE meals like this for a busy weeknight. Loved it, makes a great anytime feast and a perfect leftovers meal later on. And no meat! This is big for me. I just made this recipe tonight. I loved it, and so did my partner! The sweetness of the corn, the richness of the cheese (I added lots), and the nice balance of spices…yum. Oh, yay! I’m so glad you tried it and liked it. It’s a favourite around here too, though I’ll admit to also adding more cheese than necessary from time to time as well.